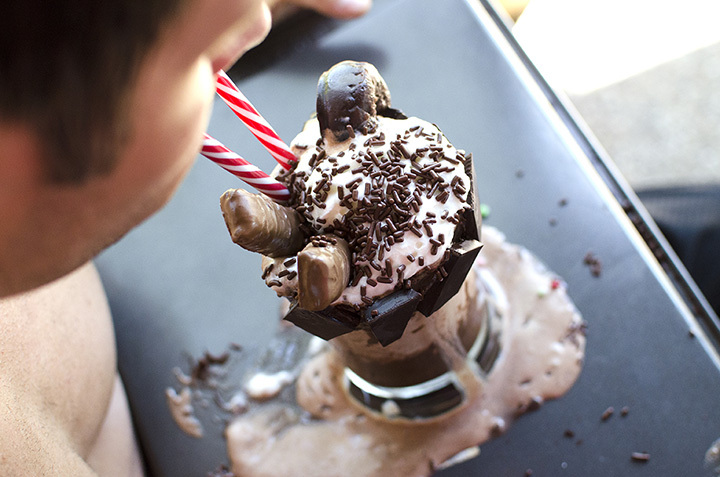 You don’t have to look far for a great milkshake in Maryland. Whether you prefer a fast-casual setting, an old-fashioned diner, or a deli, you’re likely to find a milkshake so good it’ll make your mouth water. Below are 10 of our favorite spots for such a treat! All About Burger is a regional chain that should consider changing their name to All About Milkshakes. Thirty unique shakes comprise their premium menu, including flavors like banana Oreo, chocolate cheesecake, and chocolate marshmallow. Hoffman’s Home-Made Ice Cream has been in business since 1947. The owners hand-make the over 50 flavors of ice cream every day. Check back every season for unique flavors. Wayback Burgers might be a chain, but that doesn’t mean their milkshakes aren’t up to snuff. Stop by any of their four Maryland locations (in Bel Air, Parkville, Patuxent River, and Salisbury) for delicious burgers, fries, eleven different shakes. Sports fans know Abbey Burger Bistro for their 12 flat screens across two floor bars playing the game, but milkshake fans know it for their famous spiked ice cream shakes. The shakes come in five varieties and are topped off with various liqueurs. They’re good enough to make you feel like a kid again. Chick and Ruths Delly is a local favorite. If you’re man or woman enough, we dare you to try their Colossal Shake Challenge—that’s six pounds of pure milkshake. Choose from nine different flavors in colossal size or regular. Liberty Twin Kiss is an old-fashioned walk-up or drive through burger joint, originally opened in 1963. Today, they still offer ice cream sodas, milk shakes, snow shakes, floats, flurries, and freezes in kiddie, small, medium, and large. Cheeburger, with three locations in Maryland, offers customers the opportunity to create their own milkshake. First, choose from chocolate, vanilla, or strawberry. Then, add any of 32 different toppings. Not in the creative mood? No problem. They’ve got tons of signature flavors ready to go. Gino’s Burgers and Chicken is a fast-casual burger restaurant with an open kitchen serving fresh food cooked to order. They’ve also got the three classic milkshake flavors, plus dozens more. Stop by their locations in either Glen Burnie or Towson, Maryland. You won’t find much information about Duchess on Google, but if you ask anyone in Ellicott City, you’re sure to hear all you need to know. The long-running sandwich shop is known for its sandwiches piled with meat and customizable milkshakes. Duchess doesn’t have many frills, but makes up for it with flavor. The PaperMoon Diner in Baltimore, Maryland describes itself as “an eccentric, eclectic, technicolor dining experience that might be best describe as ‘comfort food meets Baltimore with a twist.’” Their menu has a little bit of everything, including fantastic milkshakes. You can try over ten different shakes, but we think you’ll like the Bacon Milkshake. Because, well… bacon.